Followers of sport fishing have a date to keep on November 25-26 to participate in the 11th Shore Fishing Tournament held at Playa Punta Raza in the Riviera Nayarit, which welcomes professionals and amateurs not only from the region, but also from Mexico and Costa Rica. The tournament looks to boost shore fishing with an eco-conscience, which is why the competition is being held with a “catch and release” proposition for the smaller marine species in order to help with their conservation. This is a family event organized by the Tepic Surf Fishing Club, which during this 11th event has chosen the beautiful beach at Punta Raza at El Monteón in the municipality of Compostela so the participants—especially those visiting from other states—can experience the natural and tourism attractions of Mexico’s Pacific Treasure. The activity begins on November 25th with the traditional “Calienta,” a flash tournament that takes place from 4 to 7 p.m. The winner will be awarded fourth place overall. According to event director Mario Alberto Real Bernal, the formal competition starts on Sunday the 26th at 5 a.m. and continues until 3 p.m.
Snook, red snapper, grouper, white sea bass, rooster fish, mackerel, mahi-mahi, needlefish and jack are all fair game for the competition, he added; fishermen can register for $200 pesos. There will be permits for larger catches and to be considered official they need to be caught with lure only, no bait. The first place winner will take home 35% of the registration money, second place will take 25% and third place will take 10%. All winners will receive prizes in kind on behalf of the sponsors. Participants from Sonora, Sinaloa, Jalisco, Zacatecas, Nayarit and even Costa Rica are expected to arrive early. Among the particularities of this tournament is that at the end there is a symbolic recognition awarded to the largest fish in the different categories. 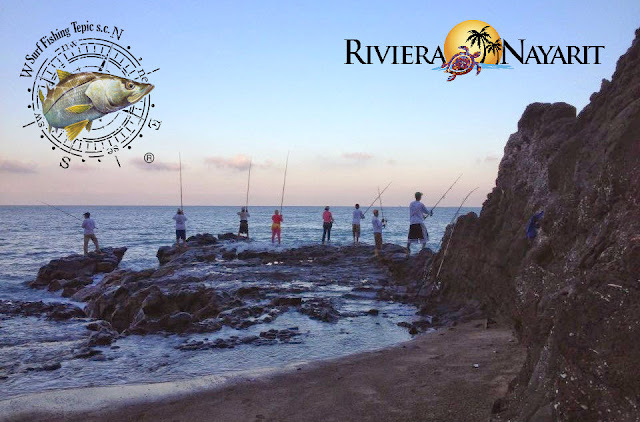 The Riviera Nayarit Convention and Visitors Bureau (CVB) and the Bahia de Banderas Hotel and Motel Association (AHMBB) with the backing of the Nayarit State Government congratulate the initiative of organizations such as the Tepic Surf Fishing Club, which contribute to the tourism promotion of the destination with events like this. Registration is open until one hour before the start of the tournament. On Saturday, Nov. 25, traditional “Calienta”: $100 pesos. (Registration Optional.) 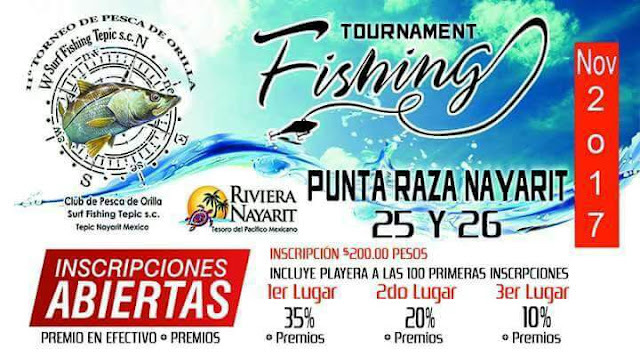 Sunday, Nov. 26, 11th Surf Fishing Tournament: $200 pesos. The cost of registration includes a t-shirt for the first 150 participants.